Material: Flame resistant fabric compounded with aluminum foil. Situation for application: applied for radiation temperature 1000 centigrade degree, which is approximated to the high-temperature area in fire site. Components: Hood, jacket, suspender trousers, gloves and foot cover. It is comply strictly with the China standard GA88-94, by national fire-fighting equipment quality surveillance test center. both european and asian sizing available, or made to custom order size. Composition: Headhood, coat,Trousers, gloves, and shoes. Looking for ideal Fireme Manufacturer & supplier ? We have a wide selection at great prices to help you get creative. 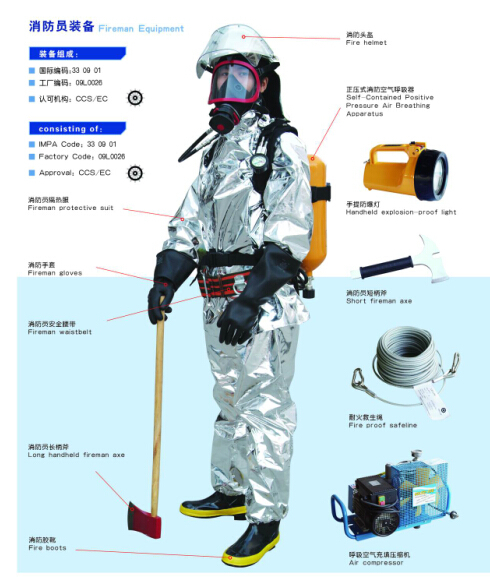 All the Fireme Protective Suit are quality guaranteed. We are China Origin Factory of Fireme. If you have any question, please feel free to contact us.